Question: Where should I stay in Venice? A few weeks ago I dreamed of having a conversation as simple as this one. So, let me help you out, because I found a perfectly nice place. It’s not a hostel and it’s not in Venice. It’s a one-star hotel and it kind of looks desperate on the outside. Check it out: Belvedere. 1. It’s cheap. Prices start from 16 euros per person. 2. Location is good. 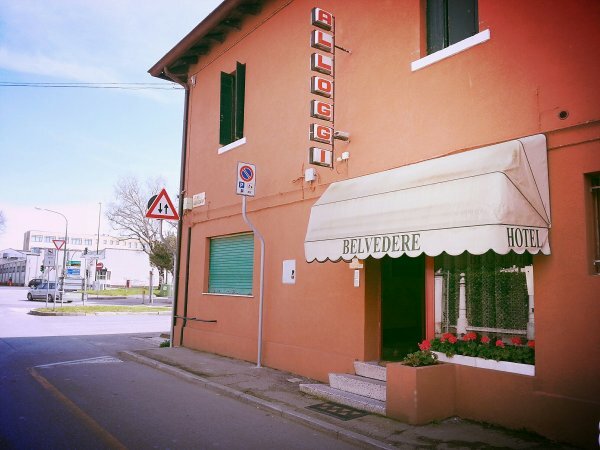 Nuova Locanda Belvedere is in Mestre, the mainland getaway to Venice. From the train station it takes only 5 to 10 minutes walking to reach the hotel. You should not worry, that you are staying in Mestre – trains for Venice leave basically every 5 minutes. During the night you can take a night bus. 3. The hotel is big, which makes it perfect for last-minute reservations, which are not that easy to make in Venice. 4. It’s extremely clean. By the time I visited (I do hope it’s not a one time thing) all rooms, toilets, common areas, smelled like flowers. 5. Belvedere has a really big terrace which is more than perfect for summer gatherings. 6. The receptionist speaks English and is ready to answer all of your questions. Enough is enough. These six points cover my criteria for a great value of money and an enjoyable stay. What you may not like and would want to have in mind is: there is no kitchen and there are no lockers. Where should I stay in Venice? Ahahah 😀 That’s another hostel! Sounds quite good. Even though I’m kind of a fan of luxury, this one sounds very nice especially considering the fair price!